16oz. 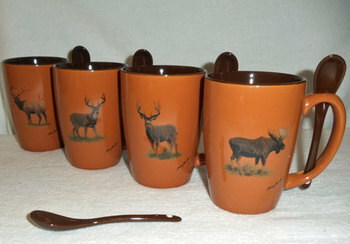 Spoon Bistro Mugs (set of 4) with Chocolate Mocha color inside and includes a matching spoon that is slotted in each handle. For Left-handed (south paw) folks, we incude the artwork on both sides of each mug. Decorated with the Big Game Animal Series (Elk, Whitetail, Mule Deer and Moose), original artwork by Dann Jacobus.